The PTX Model 1 is designed to work with smaller cameras like the AJA RovoCam, Blackmagic Design Micro Studio Camera 4K, Marshall CV-350, Canon XA models and other standalone cameras and camcorders of similar size that support VISCA, LANC or analog remote protocol. The PTX Model 2 uses the same universal support protocol, but accommodates heavier and wider cameras like the Blackmagic Ursa Mini, RED, ARRI, larger field production cameras, and DSLR-style camera bodies. In addition to pan and tilt, the PTX fixtures support commands for zoom, focus, iris, and record start/stop for many LANC and Panasonic cameras, as well as full VISCA CCU control of cameras like the AJA RovoCam and Marshall CV-350 that support the full VISCA command set. The internal wiring allows 360° rotation and 80° tilt without straining the cables. The SDI IN is used specifically with the Blackmagic Micro Studio Camera 4K, connecting the SDI out of an ATEM switcher to the camera for software control. For cameras that support genlock the SDI IN connector can be used for that signal. 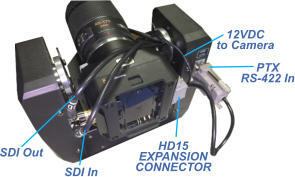 The SDI OUT comes from the BNC connection on a paired camera. 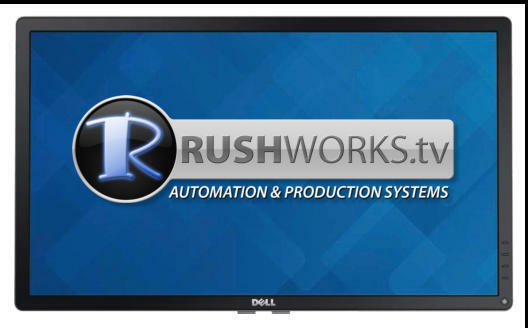 RUSHWORKS VDESK, and REMO … the ruggedized remote portable configurations … include THREE powerful and versatile user interfaces, and communicate with most serial or IP controlled PTZ cameras. 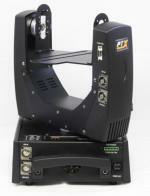 But if you’d like to use your favorite camera or camcorder with the system, the PTX makes it possible. You can configure any combination of up to 12 PTZ cameras, PTX fixtures, and manned cameras that output SD/HD-SDI or HDMI. Use the included joystick to frame shots for named and saved presets. Ctrl+R is the camera control utility embedded in VDESK and REMO, but also available as a standalone app for use on Windows OS devices. 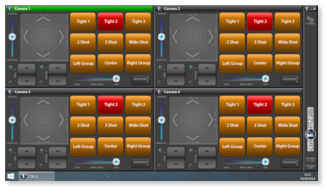 Use this app to add sophisticated camera control for production systems like the Blackmagic ATEM, NewTek TriCaster and others, as well as with dedicated hardware switchers from Panasonic, Grass Valley, Ross, Roland, Datavideo and many more. 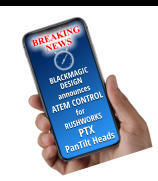 The PTX can now be controlled directly from ATEM switchers. All the ATEM switchers, when updated to the latest software, will support the interface to the Micro Studio cameras. The only caveat is that you need to usee the ATEM control panel that has the PTZ joystick, or one of the latest all-in-one switchers that has the built-in panels. Here is one of the three 14 channel DMX control profiles for the PTX Universal PanTilt heads: DMX to LANC, DMX to Panasonic remote, and DMX to VISCA. The first six channels control Pan, Tilt, Speed and Reset values. 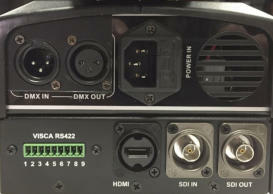 Channels 7 - 14 are unique to the PTX, translating DMX values into the protocol used by your paired camera. VISCA controllers have been around for decades, and can be used effectively with the PTX heads. Daisy-chain up to seven fixtures using the 422 connector on the controller and the same connector on the heads. Non-VISCA cameras will use LANC or Panasonic commands translated from VISCA, and output to the cameras on the wires in the PTX cable bundle.